In the past, Cathar has been considered a dirty, noisy place, with cities covering much of the planet’s surface. 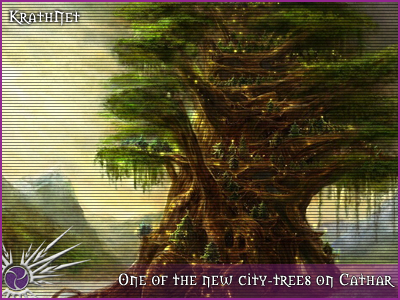 The vast trees that were the Cathar’s home for many generations were toppled or otherwise hidden amongst the more modern monstrosities that were erected. An effort to create homes for many refugees that fled there, what was supposed to have been a new start caused new problems. Many native Cathar were outspoken about such treatment of their home, and many fled for greener pastures. However in recent months, construction work all over the planet has been restoring many of these places, and making Cathar a centre for commerce. Over the past months, recycling teams from two different companies, Outback Industries and Ayervon Recycling Enterprises, scoured the planet of many of the skyscrapers and highrises that were hastily thrown up. These poorly constructed buildings gave little trouble, and the slums were able to see daylight for the first time in years. As recycling crews swept across the planet, Cathar natives assisted by Krath engineers began the slow process to rebuild the planet. The remaining buildings were inspected and restored to initial specifications, and brand new luxury apartments were placed all over the planet, both to show off the planets new-found wealth and to entice rich Cathar back to their homeworld. With enemies all around, the Cathar requested protection for their home, and so many defensive emplacements were built to help them weather any storm of war. Battle stations moved into orbit around the planet ensures their safety from all but the most determined attack. As the final touches are put into place, The Krath Dynasty wishes to inform any Cathar that live in the galaxy that they are welcome back home. Palatial villas are available for those that wish to relax amongst the trees and savannahs, they need only contact the planet’s Govenor. In addition, Cathar’s shields are passable by all as we do not wish to restrict travel to such an important place. Should security issues arise, this may change, but for the forseable future everyone can land without requesting permission from Cathar Control. The native Kiltik creatures have been repopulated, and the Cathar’s traditional Blood Hunts have been restarted after a several year hiatus, and many Cathar have already taken to the deserts to prove their worth to both themselves and their families. 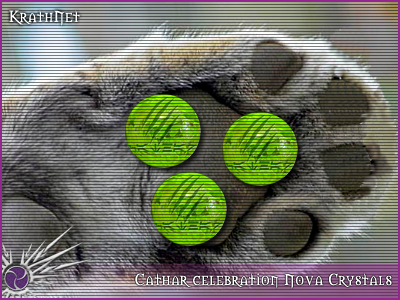 In celebration of this momentous occasion, several Nova Crystals will be specially cut, a handful being made available to Cathar around the galaxy and others being auctioned off to the rest of the galaxy, with both Outback Industries and Ayervon Recycling Enterprises will receive one in gratitude for their efforts.